Will countries adhere to International Humanitarian Law after UNSC adopts another resolution? On May 5, bombs were dropped on the al-Kammouneh refugee camp near Sarmada in Syria close to the Turkish border. At least 30 Syrian refugees including children were killed. Videos show frantic fire-fighters trying to put out flames while blood mingled with flowing water. These informal tent settlements have been around for weeks, apart from being clearly visible from the air, ruling out the possibility that the strikes were an accident. The UN High Commissioner for Human Rights Zeid Ra’ad Al-Hussein said it is “likely” that these murderous acts were “deliberate” and amount to war crimes. Apart from the refugee-camp bombing, there have been several other blatant breaches of laws of war that were considered sacrosanct. This has marked a few giant steps back for the so-called civilised world. Hospitals and health centres, for one, seem to be the hot-favourite targets for bombing parties in active war zones. The biggest attack, in terms of casualties, was on April 27 at the MSF- and ICRC-supported Al-Quds hospital that killed 55 people and injured at least 80 others. A young man covered in dust shouts, “My family, my family!’ The attack also killed the last paediatrician in the city, Dr Muhammad Wassim Maaz, who was known for his dedication to healthcare amidst the senseless war that has been unleashed on the country. A video footage shows him walking in his green hospital gown in the hospital corridors moments before a bomb shreds him apart. As many as 2,70,000 civilians are stuck in Aleppo, crushed between government forces, rebel groups, ISIS, the Turkish and Jordanian government that shoots at refugees trying to enter their country, and air bombing on the city. As ISIS advances, the internally displaced flee their refugee camps only to be met with live ammunition at the Turkish border. “Turkey’s attempt at creating a so-called safe zone is a terrible joke for civilians cowering underground and desperate to escape Syria,” Gerry Simpson, a senior refugee researcher at Human Rights Watch, had said in a statement earlier last month. With major parts of the city being burnt to a husk, Aleppo – the bustling commercial hub of Syria till four years back – now depicts a scene from hell. 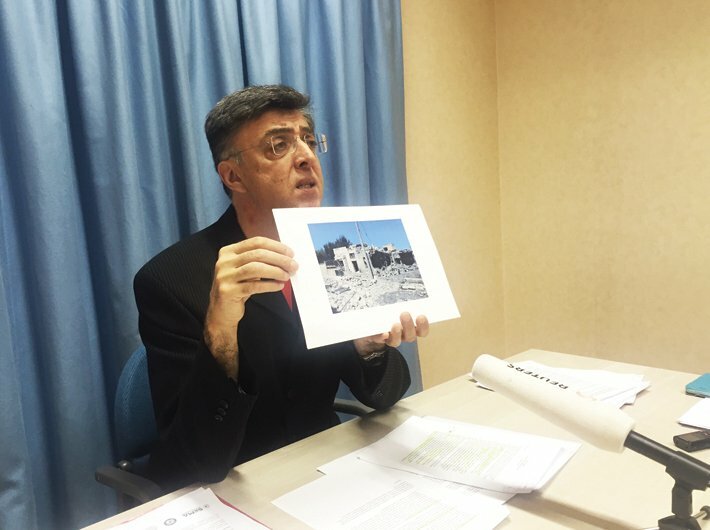 “A new red line (has been) pushed back to middle ages,” said Tawfik Chamaa, spokesperson of the Union of Medical Care and Relief Organisations (UOSSM), a group of more than 800 health workers funded by American, British, Swiss, Canadian, German, Turkish, French donors among others, who work in rebel-controlled areas. The Al-Castillo route – the only active road that connects Aleppo with the outside world for aid supplies – is threatened every day. The situation is like “another Srebrenica”, says Chamaa. The checkered city is roughly divided among Christians in the west and Sunnis in the east, apart from vast swathes of land held under ISIS. The western powers, Saudi Arabia-backed opposition groups and NGOs operating in the rebel-held area have blamed the Syrian government for the attacks on opposition territories. However, it is difficult to establish anything conclusively without ballistic analyses. All governments involved in air campaigns in Syria have denied carrying out the attacks. “Russians are not implicated in this campaign but they are not putting pressure on the Syrian government,” Chamaa told Governance Now. Bombing civilian spaces during times of conflict is a breach of International Humanitarian Law (IHL) and amounts to a war crime, if proved to be deliberate. However, bombing parties seem to be relying on this crucial clause of proving intentionality for carrying out such brutal attacks with arrogant disregard for international war norms and laws. A bombing of an MSF-hospital in Kunduz is a case in point. While MSF says that it had provided the GPS coordinates to the US military, the military says it was a case of human error when commanders mistook the hospital for a Taliban compound. However, MSF has stated that it had made desperate calls to the military to stop the bombings 12 minutes into the attack, which lasted for an hour, according to MSF. The 211 shells had killed at least 42 patients who were assured that they lay safe because of the protected status of a hospital in war zones. The US has refused pleas from the MSF for an international, independent investigation. A US military court has ruled that the Kunduz attacks were not intentional and were a case of human error. Russia, on the other hand, has blocked the referral of Syria to the International Criminal Court, making it difficult to ascertain who is bombing whom and where. The UN Commission of Inquiry on Syria has said that all parties have committed war crimes and crimes against humanity. US secretary of state John Kerry said on May 2 in Geneva, “So both sides – the opposition and the regime – have contributed to this chaos.” Except that there are no “both sides”, because the rebels constitute more than 80 groups operating in Syria supported by regional and international players, over and above the deadly Al-Nusra Front and the ISIS who are not even considered part of the February 27 ceasefire. However, Aleppo is not the only victim-city. Active battlefields are increasingly specifically targeting civilian spaces, civilians and personnel working in war zones like health workers supposed to be protected by IHL. The International Committee of the Red Cross has documented 2,400 attacks on healthcare providers in 11 war zones between 2011 and 2014. Russia has also been accused of bombing civilian targets in the Syrian war. The Saudi-led coalition of nine Arab countries has bombed civilians of Yemen to smithereens. More than 6,000 civilians have been killed in a year’s time. The UK has licensed the selling of about £5.6 billion in sales of arms, fighter jets and other military hardware to Saudi Arabia since David Cameron came to power. The US State Department has approved the sale of $1.29 billion worth of bombs to Saudi Arabia in November last year as it carried out its murderous acts in Yemen. Saudi Arabia is the biggest customer for weapons both for the US and the UK. Human Rights Watch in March called out to the US, the UK, France, and others to suspend all weapon sales to Saudi Arabia until it not only curtails its unlawful airstrikes in Yemen but also credibly investigates alleged violations. Another method of warfare that seems to have gathered traction among warring parties is the sieging of civilian areas – cutting off all humanitarian access of medical supplies, food and water – and effectively starving the population, again, something that is explicitly prohibited under IHL. “What is, I think, unique of Syria is the access problems; they are there in many places, Yemen, South Sudan, Central African Republic, etc. Besiegement is worse in Syria than in any other place on earth. It has been going on now for years, and we are now in danger of creating new besieged areas. We cannot allow that to happen,” Jan Egeland, the head of the humanitarian task force created to ensure access of humanitarian supplies to besieged and hard-to-reach areas in Syria, told reporters in Geneva on May 4. The UN Security Council (UNSC) on May 3 adopted a resolution emphasising the need to protect healthcare workers in armed conflicts and adhering to the IHL, in general. The resolution recalls “the obligation under international humanitarian law to distinguish between civilian populations and combatants, and the prohibition against indiscriminate attacks, and the obligations to do everything feasible to verify that the objectives to be attacked are neither civilians nor civilian objects and are not subject to special protection, including medical personnel their means of transport and equipment, and hospitals and other medical facilities, and recalling further the obligation to take all feasible precautions with a view to avoiding and in any event minimising harm to civilians and civilian objects”. “After five years, condemning attacks only won’t be efficient. We have an immediate need for action. All members of UNSC know this,” Chamaa said. Four of the five P5 members of the UNSC are embroiled in the Syrian crisis. Will an additional UN resolution have any real impact on the ground? “We are realistic, and we know that many resolutions have come and gone in the past, and that some have failed. Even this resolution is a reflection of a collective failure to save patients and medical workers. It will only be effective if member states actually enact it and follow through. Without that, the resolution’s words will be meaningless,” Joanne Liu, international president of MSF, told Governance Now. There were 94 attacks on MSF-supported facilities inside Syria. “When health services stop functioning as a result of attacks, people are deprived of vital care, making their lives even more unbearable in conflict-stricken areas. This is unacceptable,” Liu said. The largely-successful ceasefire of February 27 brokered by the US and Russia fell to pieces when the Syrian government allegedly started bombing Aleppo and the Saudi-backed High Negotiating Committee (HNC) that supports rebel groups left the second round of Geneva peace talks midway huffing and puffing. The UN special envoy for Syria Staffan de Mistura darted to the parties that have a significant influence on the conflict – Russia and the US. Russian foreign minister, Sergey Lavrov, on May 3, announced in Moscow that along with Washington it will set up a new operational centre by both militaries under the aegis of the UN in Geneva. Though three such centres for monitoring the ceasefire violations already exist. “I think it will be much more efficient in terms of the day-to-day exchange of information, assessments, and day-to-day (elaboration) of response measures. Right now we use video conference between the centres in Hmeimem and Amman and it was only on several occasions that the heads of those centres met face to face. Right now we will have a permanent monitoring centre where US and Russian counterparts will be sitting at the same table,” Lavrov said. The US state department announced a 48-hour cessation of hostilities in Aleppo and surrounding areas that began on May 5. It is unclear what happens after that. The future of Bashar al-Assad has emerged as the key sticking point in the UN-brokered Syria peace talks. The UN’s suggestion of having three vice-presidents drawn from rival factions under the presidentship of Assad was brushed aside by the HNC and its allies. De Mistura has indicated that he plans on beginning the third round of talks in mid-May but has not announced the dates yet. Till then, heightened dangers on the lives of civilians loom large. These legal imperatives of protecting civilian spaces in battlefields are not new. It is a matter of compliance and political will by member states. Ensuring such compliance from Turkey-, Saudi Arabia-, the UK-, US-backed rebels, Russia-backed Syrian government, Kurds, among other local groups is a tall order, as we have seen in the last six years of the brutal Syrian war, notwithstanding UN resolutions. Meanwhile, civilians continue being slaughtered every day.